Fantasy, Carl Jung and the Heavens. 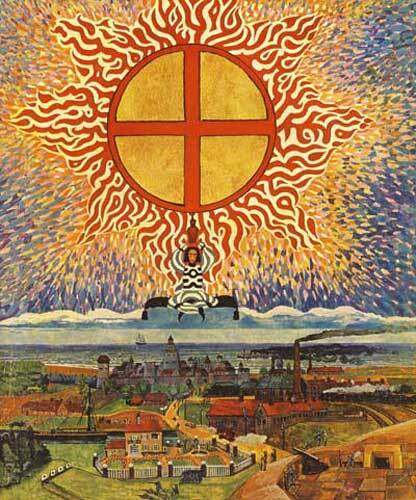 The other day my friend began to tell me about Carl G Jung’s ‘The Red Book’. So I bought it. I am astounded at the pictures inside, and fascinated with the story behind it. Before I examine it further and write a blog on it, I just wanted to show you the pictures. I am making a list of all the books to be throughly studied and this one deserves a lot of my time. This book is very expensive, and even though Carl Jung wrote it between 1913 and 1916 it was not published until 2009. There are many different views on his mental health while writing this book and painting these amazing paintings. Some say it holds infinite wisdom and some don’t! I shall read it and see. I think you would be very interested in Jenny Alexander’s blog – Writing in the House of Dreams. (wordpress) I have attended some of her writing workshops and she regularly quotes Carl Jung among other authors. Have a look.